Thank you John please send the data if you have it? What kind of controller do you use for your 5 Sun Power 327 watt panels? Are the panels wire in series or parallel? into 2 x Outback Flex Max 80 controllers. .
Each Panel wired individually via 6 mm wire to 10 amp D.C cct breaker inside then paralleled together via 80 amp cct breaker to Flex max 80. Does this system cover all you catamaran power needs. If so do you still need to run a generator at all. Normal boat electronics, Navigation Instruments, all electric winches etc etc. The only thing I need to start Gen set for (11KVa Onan) is to run my water maker (240 volts ac 14 amps). Just a little to much for inverter, it produces 180 lt per hour so normal run of 2 hours refills a 350 lt tank. There is possibility of adding second Inverter to be able to run it but then I probably would need moor Battery capacity, and maybe some moor panels. The gen set is practically brand new so might as well use it for now, it was fitted to boat when I purchased it. I want get a feel for how much Diesel it uses so as to make a decision on future expansion. Battery bank is 6 x 120 Ah Exide Gel's Normally at about 72 % in morning prior to sun up, currently 0815, Sunrise was 0510 now at 85% charge but also on my 3rd Long Black Coffee for the morning. Like good wine you can never have to much power, it's just a case of how much you want to pay for it. You may want to hook up with roetter for his LifePo4 battery setup on his Lagoon 450. That battery upgrade may be able to power your watermaker. As to Roetter, I have used a lot of his ideas and thank him for sharing his setup with us. The batteries are only 18 months old so when they take a dive will definitely look into LifePo4. Paul, we have 840Ah bank and 1140W solar with a 1600a inverter on our lagoon 400. I'd like to heat the hot water as well and a 1hr switch seems like a good idea. I was thinking of changing the element to a 500w instead of 1200w to reduce the battery draw from 100Ah to around 50Ah so the solar can heat it with less input from the batteries. I've heard it doesn't harm the batteries but I don't like seeing 100Ah going out and the inverter working hard plus the loss of efficiency. Our batteries usually drop to around 90% overnight and are full by mid day. The hot water tank stays hot for a couple of days once heated. How did you set up your switch, and what type of switch, where did you buy it? Why not heat the water with solar hot water panels instead of using electric? Just have to power a small water circulating pump. I used The Clipsal Electronic Timer Controls 2000 Series, Time Delay Switch 250V 10A - 15 hours, 3 wire, Push-button. I wired the switch between the 240 volt heater on/off cct breaker on the electrical control panel and the heater. So to operate I switch the normal heater switch on push the timer button and and leave until finished. The switch is adjustable between 0m and 15 hours. It also has a indicator light showing if on or off. The area taken up by a water heater panel is taking away from available landscape for Electrical panel. One of the things that drops Solar arrays efficiency is heat so it would make sense to see water cooled solar panels. That could do double duty. it's a long thread & takes a bit of reading, OutBack Power Technologies User Forum â€¢ View topic - How do I use every last electron? I looked through the Outback manual as I was a little confused by the meaning of this. Initially I thought the Outback has two charge outputs. I guess you mean to use the AUX signal to switch a set of two solenoids. One disconnects the Outback from the house bank, the other one connects to a 12V load. I have not heard of a 12V water heater element though. These low-voltage water-heating elements are for use as diversion loads for wind or hydroelectric systems. Use one or more of these heating elements with a charge control designed for load diversion, such as the Xantrex C40 or C60, Morningstar TS-45 or TS-60 or the Outback FlexMax 60 to turn your excess power into hot water. 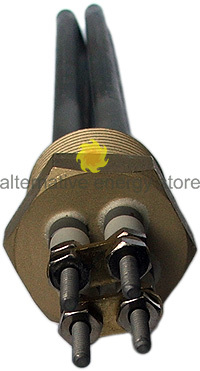 They fit most standard electric water heaters with screw-in elements. We have one model for 12- and 24 volt systems and another for higher power 24- volt systems and 48 volt systems. Each unit has two elements that can be wired in series or parallel or used individually, depending on voltage and desired amp draw.